one more filler game. i’ve had my pokemon ranch (a wiiware title) for a while now, and feel like i’ve experienced pretty much everything the title has to offer. i came in with very low expectations, but got the game anyway since i’m a completist and there’s also the added lure of getting pokemon with unique moves or abilities via special trades within the game. as you probably already know, the “game”, such as it is, is mainly just a way to store pokemon from your diamond and pearl games, although you can watch pokemon and miis interact in pretty minimal and simplistic ways. more than one reviewer has had a similar reaction as myself and nintendolife, who described it as being “a service for storing and obtaining various Pokémon that doubles as a screensaver while you’re playing Diamond/Pearl”. with diamond and pearl having long been made obsolete by newer entries (and the games weren’t among my favorite in the series anyway) the game has less value than before, and the uniqueness of the art style, such as it is, has also been lost due to the similarly underwhelming pokemon rumble series, which also debuted on wiiware and reused the same blocky pokemon models. added to that, the game had offered special event pokemon in japan and an update to make the game compatible with pokemon platinum, features that were never released elsewhere. so out of the box the game already has a lot of drawbacks to it nowadays. still, it’s mildly entertaining to watch the pokemon and miis wander around and smile at each other. it’s sort of like a virtual aquarium: nothing much really happens, but the effect is somewhat relaxing. 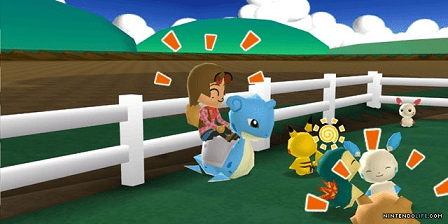 i’ve gotten in the habit of firing it up whenever i turn on my wii for some other reason just to see what new pokemon haley has brought to the ranch, and i’ll probably continue to do so in order to eventually get that ever-elusive mew (which is only made available after the ranch has a whopping 999 ‘mon). limited even for what it is (the main bummer being that the game requires you to withdraw pokemon to the same game card they came from), it’s hard to fault the game for being what it is. still, $10 for a screensaver is probably more than most people would be willing to pony up. the contemporary tool, pokemon bank, has the disadvantage of a $5 yearly charge but the advantage of permanent cloud storage across current gen and future gen game saves, for what that’s worth.